Montmelo, Spain (AP) — While Ferrari soars into the new Formula One season with high hopes of challenging Mercedes’ three-year dominance of the series, McLaren is barely able to get its car rolling. The two teams concluded eight days of preseason testing on Friday with completely contrasting prospects. Kimi Raikkonen set the best time of the preseason, pushing his Ferrari below teammate Sebastian Vettel’s leading mark from the day before by almost four-tenths of a second. “There’s a good feeling with this car,” Raikkonen said after completing 111 laps that were interrupted only when he spun out on turn 13 in the afternoon. Mercedes split the day between drivers Lewis Hamilton and new driver Valtteri Bottas, who clocked the fourth- and fifth-best times behind Carlos Sainz of Toro Rosso. But, as Vettel said on Thursday, it was possible Mercedes was holding something back and may prove to be notably quicker at the season-opening Australian Grand Prix in two weeks. 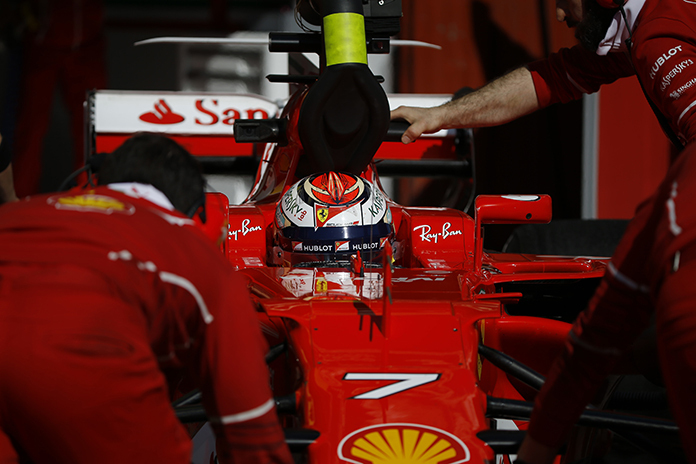 Hamilton, likewise, sized up Ferrari warily and said the Italian team may also have even more power under its hood. One team yet to benefit from the new designs was McLaren. The former F1 heavyweight had a woeful final day after Fernando Alonso’s car twice sputtered to a stop. McLaren has endured slow speeds and repeated problems with its Honda engine throughout the tests, and back-to-back stoppages during the session when teams want to be priming their cars for the first race is alarming. Alonso’s troubled car was already at the bottom of the timesheets when it ground to a halt after 16 laps. After being hauled back on a flatbed to the garage, the Spaniard ventured out again, only to provoke a second red flag when his car stopped after only two more laps. McLaren said the two stoppages were caused by “electrical issues,” and that it wasn’t sure if the problem was the same one that had also caused teammate Stoffel Vandoorne’s car to stop two times as well on Thursday. Alonso eventually returned to the track and managed to inch up to the 11th best time of the 13 drivers, on a total of just 43 laps over eight hours of testing. As for the middling outfits, Williams’ 18-year-old rookie, Lance Stroll, and Sainz crammed in a day’s high 132 laps. Sergio Perez was next with 128 in his Force India. Red Bull driver Max Verstappen had the second fastest time on Friday. But that was eight-tenths of a second off Raikkonen’s pace, indicating that Red Bull seems a step behind Ferrari and Mercedes heading into the season.